I once spoke to a former professional player who became a coach in the professional ranks and asked him whether he would change his technique during the season during his playing career. He responded in the negative. About the writer: Chris ‘Bucky’ Rogers isn’t your typical cricketer. Having toiled away in First-class cricket for over 15 years, he was finally rewarded for years of dominance opening the batting in both Australia & England with selection in the Australian Test team for the 2013 Ashes in England. He went on to play 25 Test matches for Australia where he scored 2,015 runs @ 42.87 including 5 x 100s. 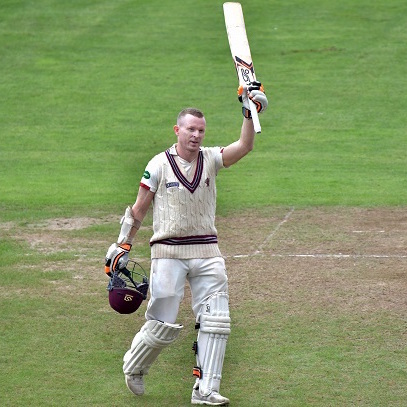 With the amazing First-class record of 25,470 runs & 76 centuries, he has now retired from playing and transitioned into coaching, where he currently is the batting coach for Somerset CCC. He said working on technique is for preseason and once he started playing, all that mattered was watching the ball. That, I’ve discovered, is a very traditional response, handed down from father to son. I had to stop myself from groaning out loud. “How short-sighted” I wanted to reply. I’m sure he’s not alone and these days, coaches are reluctant to challenge technical issues in young players, preferring the students to figure it out themselves. Perhaps they fear intervention will only create more problems. What if a player never has a pre-season as, like me, he plays continuously on both sides of the world, where the seasons overlap? Just once did I have a pre-season in Australia – and that I remember mostly for the agony of running the sand-hills at City Beach in Perth, rather than any working on technique. Instead I was chasing an endless summer by playing 12 months of the year in England as well as home. “What is a pre-season?” was my standard jibe at teammates. That meant technical experimentation had to be done on the job – so the standard answer to not work on your game for six months of the year seems like a waste of time and opportunity to me. 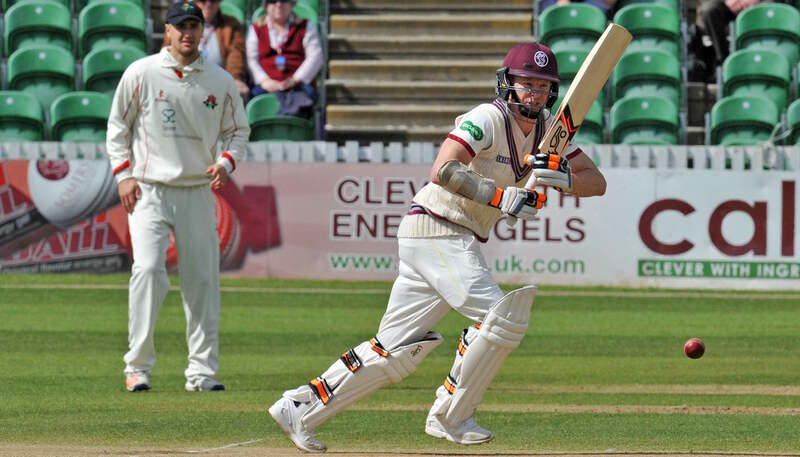 Often as a young batsman, you’ll have days when you pick up a bat and it feels like it is a natural extension of your body and other days when it feels like you’re hefting around a railway sleeper. Numerous days in grade cricket and even opening the batting for Western Australia, my swing would feel so awkward I would be trying to adjust almost every ball. I might try picking the bat up higher in my swing, other times move my hands forward in my stance and even change the width of my stance. These were just a very few of many. In fact what would really confuse me is, somehow I’d last until the lunch break feeling like I couldn’t hit one off the square and then come out after a 40 minute sit down and feel like I was Brian Lara … well not quite but you get the drift. What it taught me though was to keep trying to get better. I would often think to myself, and now sprout this to every kid possible, one step back to go two steps forward. Working with my dad who was my coach, I’d try all sorts of technical changes and usually, after a while, something would click and it would all fall into place. It would be like hitting at a brick wall and then all of a sudden one thing works and the rest fall over like dominoes. One of the great advantages of playing in four innings matches is the chance to problem solve as a batsman between the first and second innings. 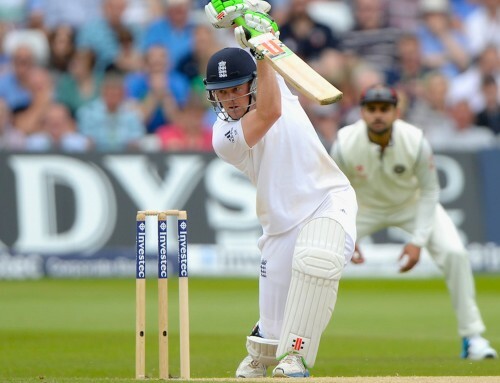 I disliked … no, I hated getting out the same way or to the same bowler in the second innings as I did in the first. After getting out I would sit down and figure out a way to combat the bowler who dismissed me first time around. It might not have just been a mental change but quite possibly a technical one. Stuart Clark once dismissed me for a duck with a perfect ball that pitched on off stump line and nipped away but instead of just accepting he’d bowled me a jaffa, I checked out the footage and saw my hands were not coming down straight in my swing pattern and caused everything – my hands and bat – to go towards mid on. So my bat actually was inside the line, hence the ball found my outside edge. Second innings, my focus was trying to get my hands to go towards mid-off while playing with the inside half of my bat to counter the away movement. Yes I know this is a bit more than ‘Batting 101’ but I only started to understand my own batting by constantly tinkering – even to the extent of working out what doesn’t work, to find out what does. As I moved from player to become a coach, a surprise first-up piece of advice from other coaches was to be careful about the level of input you try to pass on. Yes, that makes sense and it would be ignorant to not listen to advice from people who have spent a long time coaching. However, it will need to be balanced against my long-held belief that the best players in the world never stop seeking improvement. 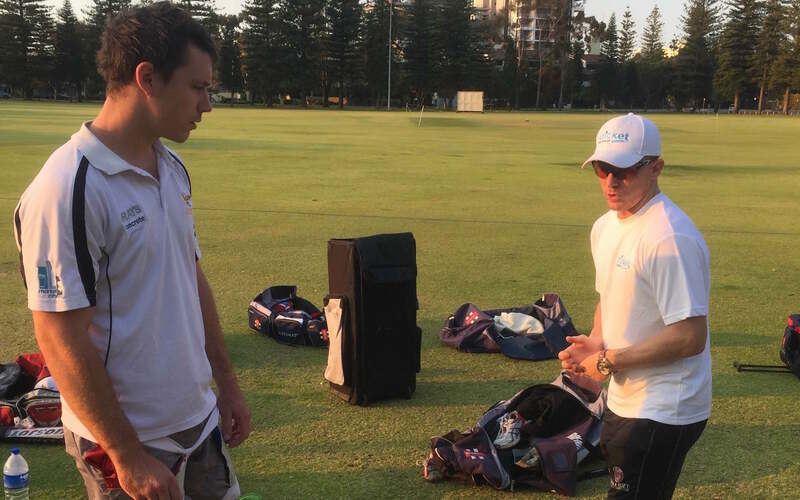 My first club-coaching role came via former Australian player and teammate Bob Quiney to help out at his beloved St Kilda Cricket Club, where the players have an average age younger than ever and a thirst for learning. I was wary of saying too much early, but when one player said, “I’ll do whatever you tell me to do Buck”, my tinkering instincts took over. “One step back to go two steps forward”, I reasoned. The first player asked me how to play slow medium pace bowlers as he had nicked off to one the previous Saturday. I told him to be positive and proactive. Walk at the bowler or walk into his line … a la Steve Smith … and whip him through the leg side if the bowler went for the stumps. The next Saturday he was in the same position and ended up, he said, with too much going through his mind and being neither proactive nor defensive. He nicked off again. But he had learnt from his mistake and knew what he’d do the next time and since has had some success. Another had what I call ‘indoor nets syndrome’ and had developed a swing where he just jabbed at balls that would race off his bat on the true synthetic surface, but had difficulty with the natural variation of turf wickets. His hands would go towards the leg side in his swing but the ball would slice to cover or more likely the slips. I was wary of trying to reshape his whole swing but then thought “Why not?” I’ll show him what I think works and he can figure the end result out for himself”. He was quite difficult to adjust and we even experimented with grip changes, not something I’d usually recommend. After an hour’s work he was starting to get the basic principles and enjoying it. He had a far better understanding of a swing after trying something new and that can only benefit him. He can always go back to what he was doing but at least he’d tinkered and thought about it. Afterwards he seemed genuinely excited at the change and the understanding. Yet there have been plenty of times where my coaching hasn’t worked. I tried to help Peter Siddle with his batting but made it worse. Eventually he figured a few things out himself and is still getting better – so maybe my “one-step-backwards” theory helped! With most things, change takes time to feel natural and this principle needs to be stressed and I’m wary of trying to change players into playing like me but sometimes certain things need to be tried. I’m amazed when I see any tall player stand with his feet close together in his stance when Kevin Pietersen is ‘Example A’ of how to succeed as a tall batsman. I firmly believe all the best players in the world are tinkerers and never stop trying to improve. Just ask Marcus Trescothick, who at age 41 was still telling everyone how he’s trying to fix things. That and his saying that ‘form hides in mysterious places’ were my two favourite things I got from him. At the moment the county season has just started and he’s still working on his game plan against different kind of bowling. You’d think he’d have it all sorted by now but no, he’s using every opportunity to improve as we all should. When asking me to write this article, Scolls (Tom Scollay) asked that I write a little about my own journey and how I managed to play well in the 2015 Ashes at age 38. Like Trescothick, I had a thirst for perfection. Grit and determination was only a part of it. So many years of 12-months-playing of four-day cricket meant I had a very good understanding of my own game, with all its strengths and weaknesses, and to have some success against James Anderson, Stuart Broad, Mark Wood and Steve Finn in bowler-friendly conditions was only possible with an in depth, intimate knowledge of my swing and my game. For different bowlers and conditions, I would have different triggers. On the wickets that provided more bounce and seam I would have a back and across trigger while at other times, particularly against Anderson’s swing, I would push forward to try and cover the movement. This skill only comes from trial and error and experimentation and willingness to learn. If every time I tried something, had initial failure and not persevered, my game would have been very one dimensional and limited. Growing up I often watched in awe some of the bigger kids who seemed to make batting look easy but then fell away when they had to play against adults who matched them in size and strength. I believe it was because these kids had got it so easy early on, that they hadn’t learned to work at their game to try to understand it better. Of course, there are plenty of examples to disprove the mould but of all the best batsmen I have seen, the one consistent attribute they possess is a desire to never be satisfied and to chase improvement. They tinker to learn … and then comes improvement. If you enjoy our thoughts and insight into the game then please Subscribe to get our articles straight to your email (keep an eye on your junk mail as they sometimes end up in there). This is really interesting, keep it up! !